Located in North Wales, this interesting town was built on the estuary of the River Dwyryd just south of Porthmadog during the mid 1900s. It stands out from the neighbouring towns because it has been built in the style of a town along the Italian Riviera, with quirky, elegant buildings and central gardens. 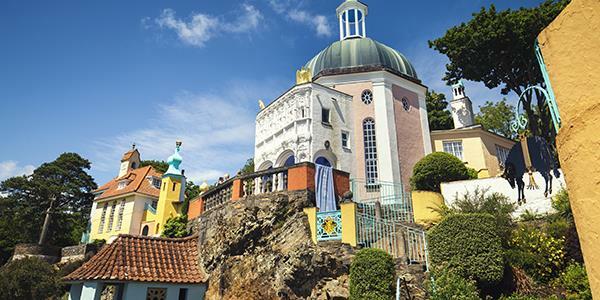 Its architect, Sir Clough Williams-Ellis designed the town with the Mediterranean in mind, having fallen in love with the small fishing villages and resorts of the Italian coast while he was visiting. 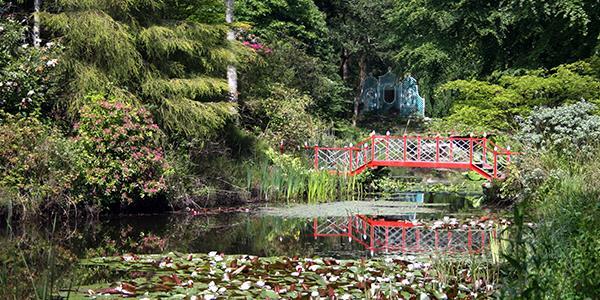 He set about building his little Welsh haven in 1925 and the work was completed 50 years later. Now acknowledged as an architectural work of art, this clifftop town overlooks the Dwyryd estury and the picturesque Tremadog Bay beyond. A lot of the building work here incorporated fragments of the demolished buildings of previous architects. This eclectic style was almost Baroque in appearance and is said to have been an influence on later 20th century postmodern architecture. Interesting and brightly coloured buildings are grouped around ornamental gardens and little squares. It’s a great place to explore. Situated, as it is, on the fringe of Snowdonia National Park, there are some very beautiful surroundings for walks if you want to venture further afield and the town itself is bordered by 70 acres of beautiful woodland. If you leave the town centre through the Triumphal Arch, the woodland walks will span outwards and you will come across the Gwyllt Wild Gardens in the grounds of Castell Deudraeth. This crenelated building was previously owned by George Henry Caton Haigh and it was he who originally planted out the gardens. Williams-Ellis developed them when he took the building on, and planned the ornamental lakes that are now there. The gardens continued to flourish even after his time and they host a large collection of trees, rhododendrons, camellias, azaleas and exotic plants. All do so well here thanks to the peninsula’s very mild and sheltered climate. To the west, the town opens into a wide sandy stretch of beach. 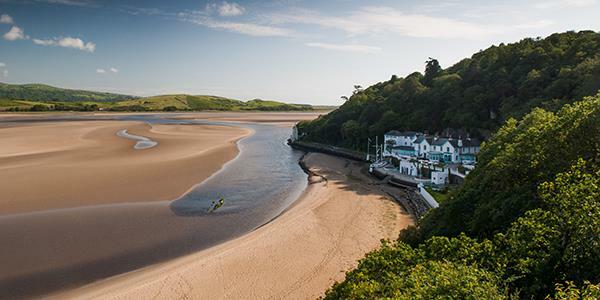 The quayside and the Portmeirion Hotel, which was Williams-Ellis’s main focal point during the development and reimagining of the town, are key features of the coastline. There are great views from the terrace and the coast path that runs beneath it. It’s here that you will find a reconstruction of the Amis Reunis, a boat that was shipwrecked, sculpted out of stone into quayside. At low tide you can wander out onto the sands towards Tremadog Bay. Because it faces west, the bay enjoys some really lovely sunsets. The town’s claim to fame comes in the shape of the 1960s television series The Prisoner. 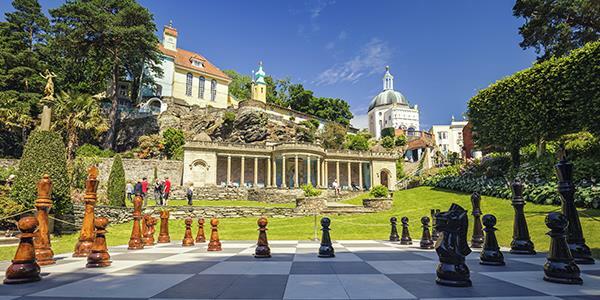 Portmeirion played the role of ‘The Village’ in the iconic series and Patrick McGoohan played the main character, 'Number Six'. The town now has its very own shop dedicated to souvenirs of the show. The Central Piazza was where that famous game of chess was played episode nine. Every September the town is also host to Festival N°6 which is an art and music festival and has seen the likes of Bastille, Kaiser Chiefs, Clean Cut Kid, The Cinematic Orchestra, James Bay, Caitlin Moran and Phil Jupitus among many, many others. 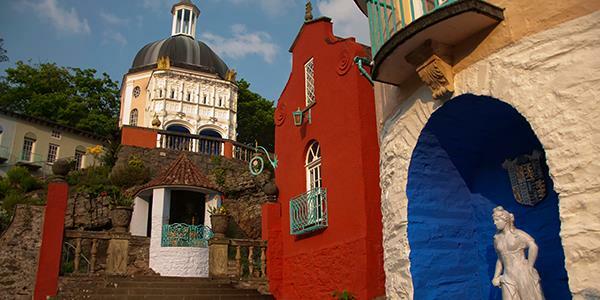 Clough's daughter Susan Williams-Ellis would go on to establish the world famous Portmeirion pottery in the 1960s. She initially worked with her father on the development of some of Portmeirion’s gardens in the ‘50s and eventually took over the running of the shops there, but would later move to start her now famous pottery business with her husband. This interesting little Italianate town on the Welsh coast has an abundance of pretty buildings that are part of the hotel complex, along with pubs, shops and an array of nice walks. It is now owned by a charitable trust and well worth a visit while you’re in North Wales.